We begin to see small islands as the sun makes patterns with this cloud. 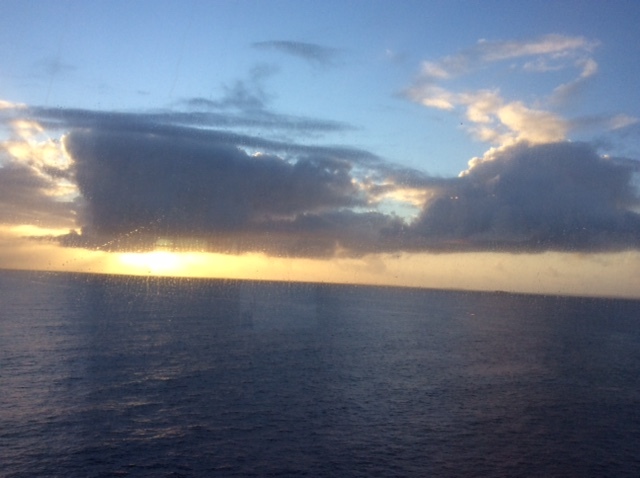 We’re turning, so soon the sunrise will be astern of us, coming into the first port in the Tongan group. Later. Came ashore in this little town. Doing wifi in a pub with wooden stools. Cars still driving on the left side of the road. Not hot, just nice. As the light changes, the sea becomes an increasingly intense blue and more detail in the different green growth on the islands becomes clear. Far beaches gleam in the high sun. We’re just at the end of our fourth week, with three weeks to go. 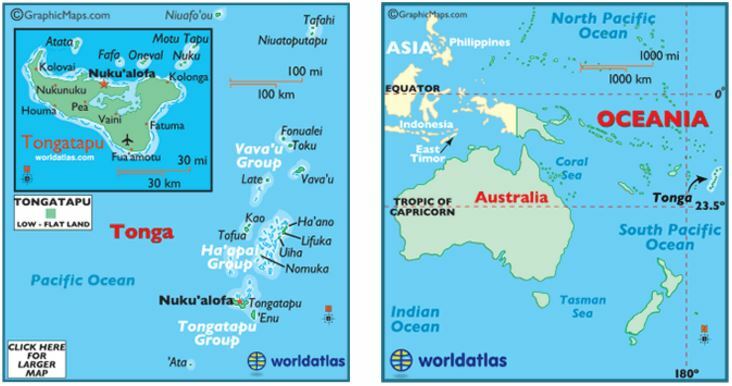 Between now and when we’ll start the long route back to San Diego, (which will take us that whole last week,) we’ll be exploring French Polynesia, the Tongan group, Bora Bora, Raiatea, and Tahiti. I’ll celebrate my 83rd birthday aboard and will report. We’ve gotten the cruise director to say he’ll put “Choral Enthusiasts ” on the daily schedule. Up to now they’ve given us the space but no way to tell people we were there. 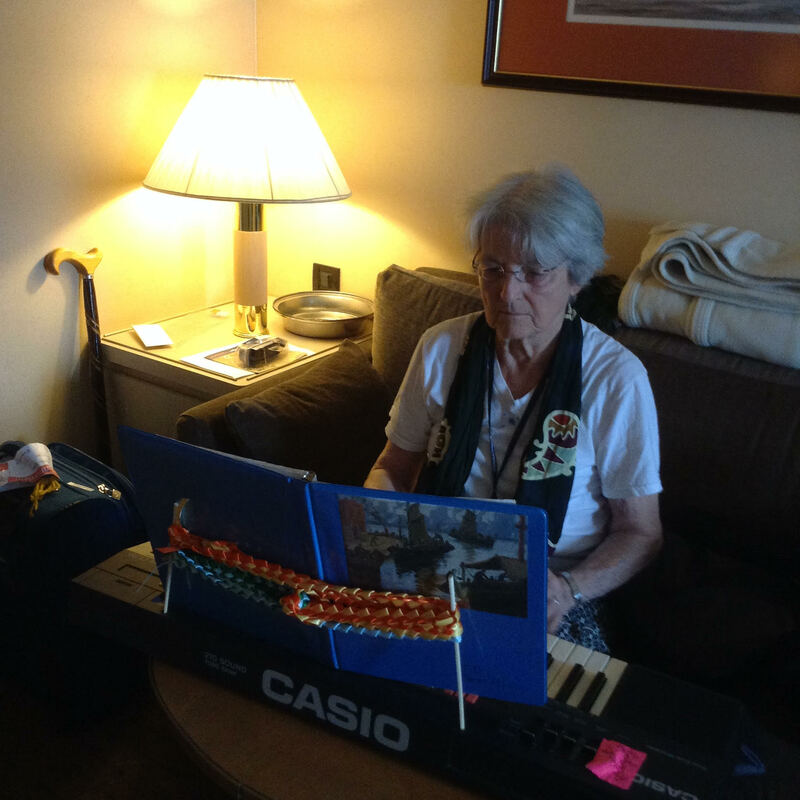 In spite of that, yesterday three of us convened, I with the keyboard, and actually sang for half an hour! We knew enough of the same rounds to do several, and we could do parts on “Amazing Grace,” albeit our tenor was a little wobbly, sung by me. It felt so good though just to be making music! It helps a lot to have the keyboard when you’re learning new songs or even just starting out on a familiar song together. And none of us was under 60 I’d guess, so these old voices could use all the support they could get. I think of Norwood Hinkle at Putney, with his wife Cornelia at the piano, forging ahead, every Friday night right after supper, getting all 150 of us, whether we liked it or not, singing. We were boys and girls, 9th through 12th grade. We sat on wooden benches with no backs, in the Assembly Hall, divided soprano, alto, tenor, bass, from left to right, in Norwood’s view. He didn’t bother with warm-up, though we probably started with rounds, and new, incoming students would simply pick them up from older students. They were written out, several dozen of them, like “Dona Nobis Pacem,” “Great Tom is Cast,” “Fie, Nay Prithee, John,” and several “Alleluias.” But eventually we all knew all of them. Dave Schauffler and I still had sheets copied from those original ones, in Cornelia’s hand. Besides those, we sang a lot of music: Handel, Haydn, Brahms. This new friend yesterday knew “Hey ho, nobody home” and we taught it to Sue Moore, the other person who’s helping get this going, who picked it up quickly. I have brought four copies of my “Saving Songs” songbook that I assembled for our sing on 11-11-11, my 79th birthday, and we can get copies made at the front desk of some of those pages that will be most likely to appeal. Sue has already had some songs copied. Happy Birthday today to granddaughter Julia Lincoln Carr, who was born in New Zealand. We are practically there, Julia….only a few hundred miles away, and we remember coming to visit you when you were just a few months old. 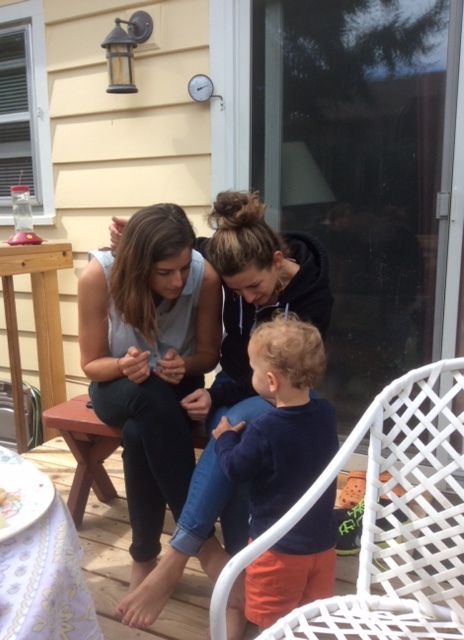 We do love you so, and I love this picture of you and Hannah with Noah this summer. The air today is just mild, breezy, completely pleasant, as it was yesterday. And the shifting colors of the water continue to amaze us: deep purple, beyond day-glo azure. 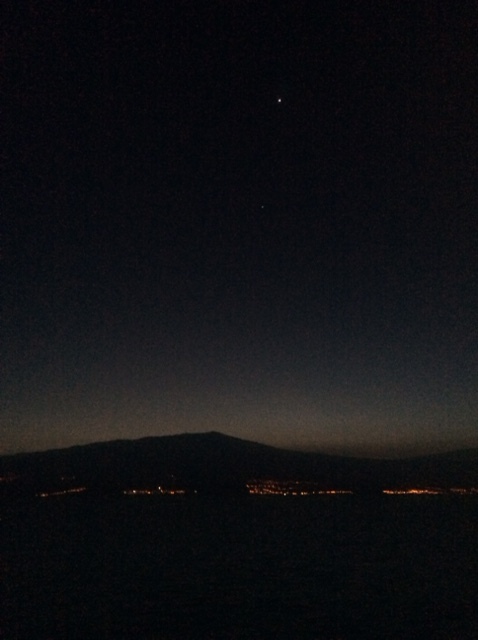 Dawn over Hawaii, the Big Island as it’s known, holds two great stars one over the other. A passing couple, on the Promenade deck where I come to take a picture, think the bright one is Vega. We left Honolulu last evening. We’ve just given five blasts, then two blasts, don’t seem to be slowing much. Some crew have arrived next to me, cordoned off the area under two tenders and are getting ready to lower them. So we must be nearing Kona, and it will be a “tender port,” not one where we are up against a pier. Dinner was festive last night, the dining room decorated for Canadian Thanksgiving, Columbus Day, Discoverer’ Day. 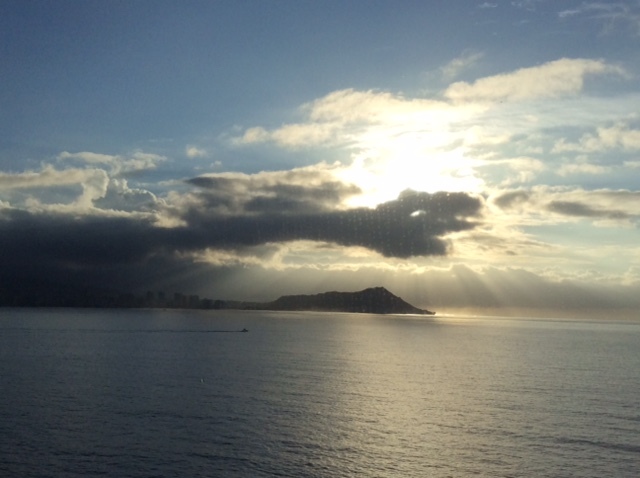 After a day when clouds engulfed us and the whole island of Oahu, we had had a nice view before dinner of the late afternoon sun on the city. Our enjoyment of the harbor life included a fascinating sequence during the fueling of the Amsterdam on Sunday. We happened to eat our lunch at a table with windows right over the fueling barge, so we could follow the activity in detail at the end, the taking away of the orange, floating barrier from around the outside, the arrival of tugs Pi’ilani and Namahoe, the attaching of what would eventually be a huge tow chain between the barge, Ne ena, and Namahoe, the larger of the two tugs, and finally the hoisting aboard by the yellow cranes of the two fenders. 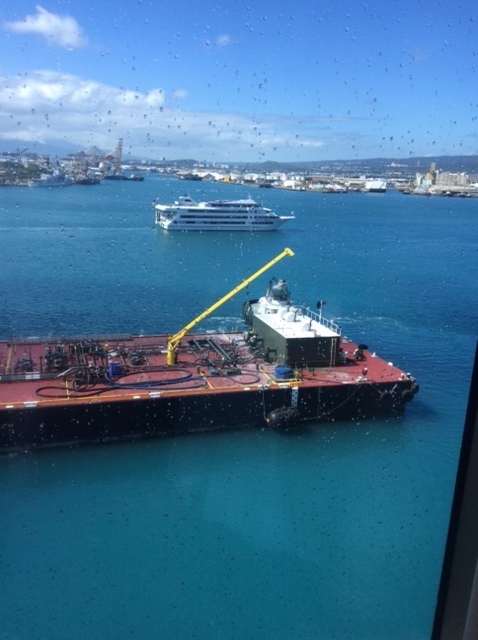 So here we are, backed down, anchored, with the tenders whiling away time in the waters around us until they’re needed to shuttle people to and from Kona. It’s only 6:45 so they’ll have a bit of a wait unless some people are heading off on long shore excursions and have to start early. When we were exploring this island sixteen years ago, we were still taking photos with a non-digital camera, and I remember one wonderful one of Tom walking alone on an expanse of dormant lava, two panoramic-views-worth, not a sprig of grass or a plant of any kind in sight. We were in a hotel in Kona when Hester called to say my mother had gone into the hospital and they wanted to do surgery for a bowel obstruction. We discussed the pros and cons of doing surgery. Ma was 90 and we wondered how she would survive it, but they decided to go ahead with it. We flew home in the next 24 hours, but only in time to be with her as she died. She had come through the surgery all right, but her heart had given out in the recovery room. In spite of her POLST saying she didn’t want it, they put her on life support, perhaps to keep her alive until we got there. At least that is how it turned out. We stood around her, three generations of us, in the sunlight that, from where I was sitting next to her, refracted like a jewel in her blue, blue eye as she died. Now we can add to the saga of the keyboard. Holland America, via the Entertainment Director, had continued to refuse me the privilege of practicing on any of the three pianos aboard Amsterdam. 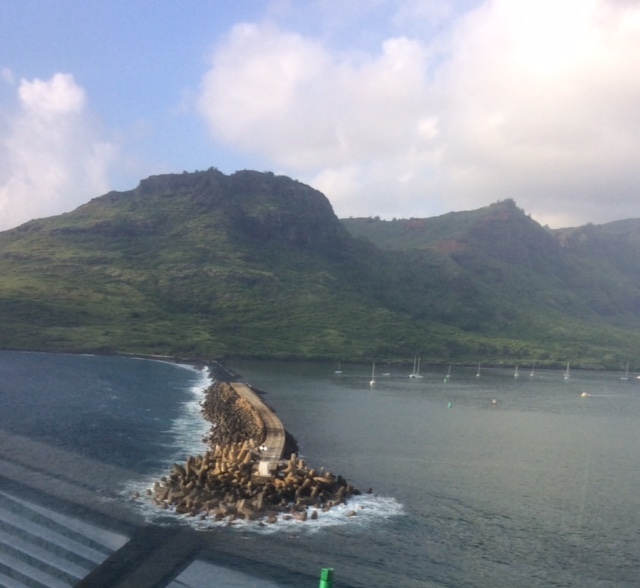 So I asked son Tom to send our four-octave ke….yboard to me c/o the ship in Honolulu. Our friend Bryan at FedEx in Portland had packed it up and sent it off. I had been in touch with the front desk and with Frank, the Port Agent, so I’d found out it had gotten as far as the HAL offices on shore. When we got back from dinner last night there it was delivered, sitting on our couch. This morning, I first made a music rack out of two chopsticks with the ribbon leis that we made strung between them, and it’s the perfect support for my notebook full of my music. And putting it on the table in our cabin and sitting on the couch gets just the right level. In the other arrangement, when I was using the ship’s pianos, I had to play at the crack of dawn before anyone else was up. Now I can practice any time of day. Thank you so much, Tom and Bryan! Today, our second day in Honolulu, I’ve come ashore and walked just a few blocks along Ala Moana to a Starbucks where I can get on line for free at a breezy outdoor table. Will also do some banking and pay some bills on line before we set off for Fanning Island and points West and South. “But they’re in your black toilet kit,” I said, hoping I was right. He’d said that’s what was in there, but he’d just looked and said it wasn’t, began to talk about calling Jim at the pharmacy in Portland. I went to get the kit, realizing he might be angry at the implication that he hadn’t looked carefully enough, while he pulled out one of the empty suitcases and started to look in there. Perhaps I was just going to find nothing. So a crisis was recognized to be not a crisis. And actually we had a new look at Tom’s brain which had not perceived something, probably because his “mild cognitive impairment” (a phrase he loves to roll off his tongue) caused a panic that blinded him: unfamiliar place, imagined failure, no memory of transferring those particular pills into the Ziploc bag. 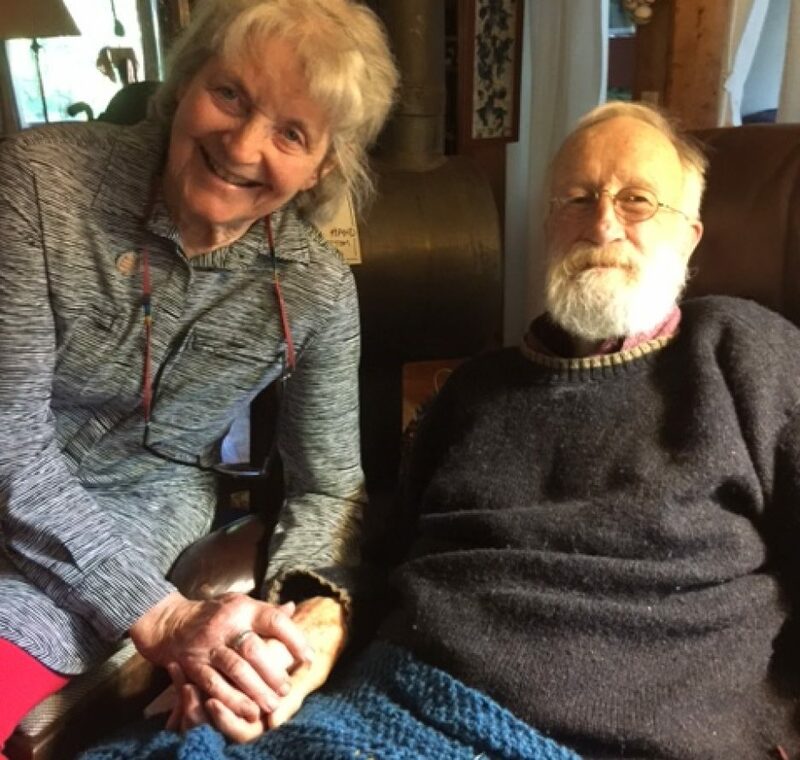 Interesting and good that moments like this don’t seem to interfere at all with our overall enjoyment of the days, our reading, watercolor painting, writing group and crafts group on “Sea days,” delicious meals and Happy Hour in the Crow’s Nest. And at most times, in fact, his memory works fine. In almost to the first breakwater at Nawiliwili on the SE corner of Kauai, we can now see the rich mix of colors on the cliffs: the red dirt of the exposed areas lies next to several different greens, blacks, purples. I can already see the pier where we’ve sat sketching in the past. 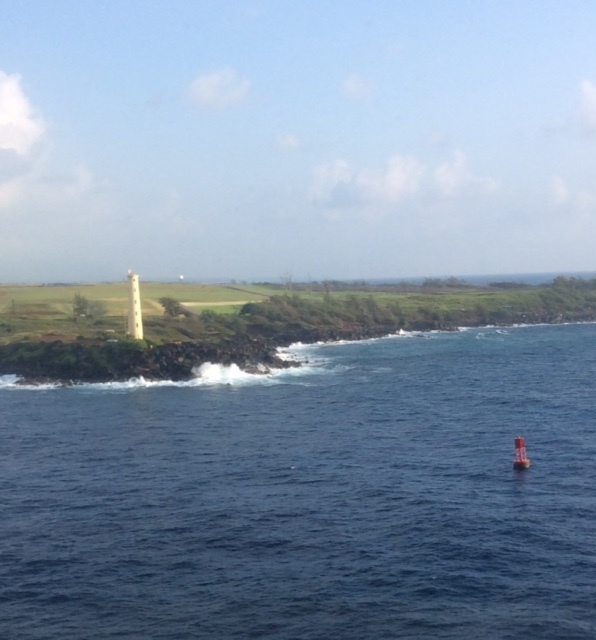 Beyond the first headland, you can see another that sticks out South over near Poipu. The main mass of the mountain in the middle of the island is covered as it often is in clouds whose tops reach up and catch the sun. It’s a bit confusing, using this alliteration to remind yourself that, coming in to a harbor, you leave the red buoys to your starboard and the green ones to your port in order not to stray from the channel. Then, leaving, it’s the opposite. But “Red is the Color of Port Wine” is what you use to remember that on the bow, at night, a red light is on the port side and a green one on the starboard. We can think of harbors all over the world where we’ve navigated small boats to the safety of a dock or a mooring: New England, Greece, the Canadian and American San Juans, mostly sailboats, but an occasional “stinkpot” as we called them scornfully except when we were aboard one and very happy to be there. We even spent a week on the River Wey in mid-winter once on a Narrow Boat, sometimes having to break through ice but cosy and warm below. It didn’t take long to learn how to work the locks. You picked up local knowledge as you went along like how much the water level might change in the night and how to adjust your mooring lines so you wouldn’t be strung up. My father later wrote a delightful article for a Seattle magazine about the whole experience. The art of piloting was wonderfully described in a talk we heard at the Maritime Museum in Astoria, Oregon. The speaker was a Columbia River Bar Pilot himself, and there’s no doubt that that Bar is one of the most dangerous in the world. He described what were nearly drastic experiences with captains who didn’t have much sense or tried to refuse his advice. Here on a calm, warm day in Hawaii there was very little tension, I suspect, and we glided in, slowed to a stop, sidled with our thrusters pushing us in port side to the dock.